The 2018 baseball season came to an END on Tuesday Night for the New York Yankees, when the Boston Red Sox CELEBRATED at Yankee Stadium for the SECOND time this season. 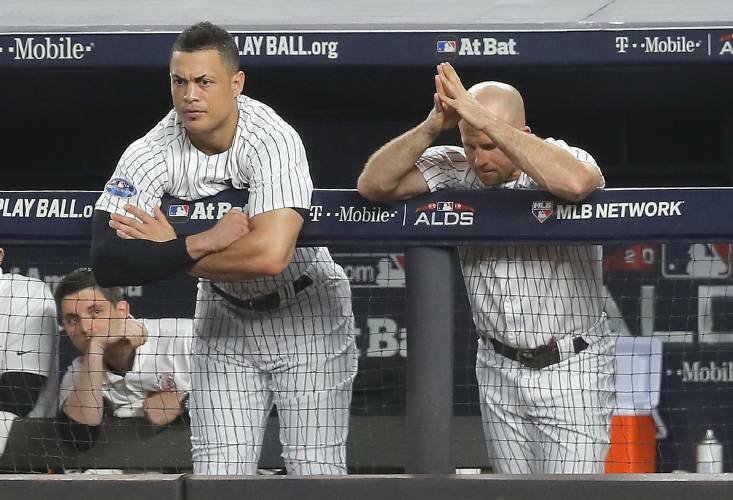 This was a WEIRD season for the Yankees because EVEN THOUGH they had the THIRD best record in baseball, it NEVER felt like they were going to WIN the World Series and it sends the Bronx Bombers into a LONG offseason with A LOT of questions left to answer from the Front Office. In 2017, the Yankees went to Game SEVEN of the ALCS and they ADDED the National League MVP Giancarlo Stanton to their roster, so expectations were RAISED for the Yankees but that was NOT the case. Stanton took a LONG time to ADJUST to New York and had a DECENT regular season, NOT what the Yankees expected from him, and in the Playoffs, he was AWFUL. Stanton was NEVER able to get that BIG hit and TWICE in the ALDS, Stanton came to bat representing the TYING run with the Yankees trailing and he STRUCK OUT BOTH times much to the CHAGRIN to me and the REST of Yankeeland. He needs to get A LOT better this offseason and COMMAND the Clubhouse and LEAD by example in 2019. The Yankees hit the MOST Home Runs as a team in baseball HISTORY this season, but in the Postseason they went COLD and LOST two games at HOME. The offense is TOO reliant on Home Runs in the offseason, ALL the hitters on the team need to get BETTER at getting ON base and driving runners IN without the Home Run. IF they HAD BEEN able to do that this season, the Yankees would STILL be ALIVE in the Playoffs. The Pitching staff was QUESTIONABLE at best this season, Luis Severino pitched like an ACE till July 1st and from then he was ONE of the WORST pitchers in baseball. He got the ball in Game THREE of the ALDS and he was TRASH, IF he is HURT, he needs to get HEALTHY and have a COMPLETE season in 2019 and pitch like the ACE that he is and be in CONTENTION for the AL Cy Young. Masahiro Tanaka was GOOD this season, and he showed up in the Playoffs, he needs to BUILD on this season and CHALLENGE Severino for being the BEST starter on the roster. CC Sabathia and J.A. Happ are free agents this offseason, I would LOVE for them to come back to the Yankees but that is UP in the AIR. The Bullpen was GOOD this season but it was NOT the SHUTDOWN Bullpen we thought it was going to be. Aroldis Chapman, Dellin Betances, and Chad Green have become STAPLES in the Bullpen and should be the FRONT of the Bullpen next season. Tommy Kahnle, AJ Cole, and Chance Adams were NOT good this season, IF they can get BETTER and be part of the EVERYDAY Bullpen then they can be GREAT again. David Robertson and Zach Britton are FREE Agents so we will see WHAT happens with them in the offseason. Aaron Boone was a ROOKIE manager this season and he did NOT do a BAD job but he had a TERRIBLE Playoffs. Asking someone who had NEVER coached before to be the HEAD guy of a team whose fanbase EXPECTS a CHAMPIONSHIP was NOT a great decision by the Front Office. Boone should BUILD on this season and get A LOT better STIRRING the Yankee ship in 2019. The plan EVER SINCE the Yankees started this REBUILDING process was to be AGGRESSIVE in the Free Agency of 2018-19 and be the FRONTRUNNERS for the World Series in 2019. The Yankees have UNLIMITED money to spent this offseason and that will NOT affect their Luxury Tax THRESHOLD so I expect them to SIGN a TON of MARQUEE Free Agents this offseason and get the roster in PRIME position to WIN the World Series in 2019. Brian Cashman has made some QUESTIONABLE moves to stay UNDER the Luxury Tax THRESHOLD over the past FEW seasons, the THRESHOLD NO longer EXISTS so he can REDEEM himself this offseason. That about puts a BOW on the 2018 Yankees season. Over the offseason, I do NOT expect a TON of content surrounding the Yankees but IF and WHEN they START signing the MARQUEE Free Agents, I will have that covered. I want to thank the THREE readers that read my blogs this season, see you NEXT season. It is STILL #RedSoxYear and they are the 2018 World Series CHAMPIONS, so CONGRATS to them.